It is important to note that some minor changes have been made to the University’s Closed Circuit Television Monitoring and Recording of Public Areas for Safety and Security Purposes Policy. The changes to this policy were approved at the March 2008 meeting of the CCTV Monitoring Panel. The policy, initially published in April 1999, has been updated to accurately reflect advancements in CCTV technology and to address administrative changes to committee titles within the University. The purpose of this policy is to regulate the use of closed circuit television (CCTV) cameras to monitor and record areas for the purposes of safety and security. Building perimeters, cashier locations and entrances and exits of: lobbies and corridors, receiving docks, special storage areas, laboratories, etc. Monitor and record restricted access transactions at entrances to buildings and other areas. Transit stops, parking lots, public streets (enclosed and unenclosed), shopping areas and vehicle intersections, bike racks, University artwork and sculptures, etc. A. The Division of Public Safety is committed to enhancing the quality of life of the campus community by integrating the best practices of public and private policing with state-of-the-art technology. A critical component of a comprehensive security plan using state-of-the-art technology is closed circuit television (CCTV). B. 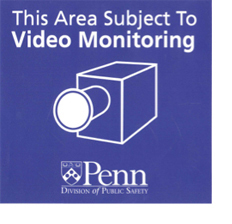 The purpose of CCTV monitoring under this policy is to deter crime and to assist the Penn Police in protecting the safety and property of the University community. Any diversion of security technologies and personnel for other purposes, would undermine the acceptability of these resources for critical safety goals and is therefore prohibited by this policy. C. Video monitoring for safety and security purposes will be conducted in a professional, ethical and legal manner. D. Video monitoring for safety and security purposes will be conducted in a manner consistent with all existing University policies, including the Non-Discrimination Policy, the Sexual Harassment Policy, Open Expression Guidelines and other relevant policies. The PennComm Dispatcher Training Procedures, kept in the PennComm Communications Center and disseminated to appropriate personnel, prohibit monitoring based on the characteristics and classifications contained in the Non-Discrimination Policy (e.g., race, gender, sexual orientation, national origin, disability, etc.). E. Video monitoring for safety and security purposes at the University will be conducted in a manner that does not violate the reasonable expectation to privacy as defined by law. For example, recognizing that students may also have an enhanced expectation of privacy in the hallways and lounges of residence facilities, CCTV monitoring for safety and security purposes will not be used in residential building hallways and lounges unless the Vice President for Public Safety determines a specific safety/security risk exists. F. Information obtained through video monitoring authorized under this policy will be used for security and law enforcement purposes. If, in the course of a legitimate, safety-related use of video monitoring, information is collected and related to safety and security that warrants disciplinary action, such action may be taken provided that employee or student discipline was not the reason for the installation of the camera and/or the monitoring itself. Information obtained in violation of this policy may not be used in a disciplinary proceeding against a member of the University faculty, staff or student body. G. Information obtained through video monitoring under this policy will only be released outside of Penn when authorized by the Vice President for Public Safety or the Vice President for Public Safety with the CCTV Monitoring Panel, as described in this policy. H. To maintain an informed University community, the Division of Public Safety will periodically disseminate written materials describing the location of outdoor cameras, as well as the purpose of and guidelines pertaining to CCTV monitoring. I. All personnel involved in video monitoring will be appropriately trained and supervised in the responsible use of this technology. J. Violations of this policy will result in disciplinary action consistent with the rules and regulations governing employees of the University. K. All video monitoring and recording for safety and security purposes must comply with this policy. A. The Division of Public Safety is the department authorized to oversee and coordinate the use of CCTV monitoring for safety and security purposes at the University. B. The Vice President for Public Safety, in concert with the CCTV Monitoring Panel under certain circumstances described below, has the responsibility to authorize all CCTV monitoring for safety and security purposes at the University. Any approved installations must be installed by the Division of Public Safety’s security integrator. C. The Division of Public Safety has primary responsibility for disseminating the policy and assisting other units in implementing the policy and procedures. D. All University areas using CCTV monitoring for safety and security purposes are responsible for implementing this policy in their respective operations. E. Existing CCTV monitoring systems will be periodically evaluated by the Division of Public Safety for compliance with this policy. F. The Division of Public Safety will monitor new developments in the relevant law and in security industry practices to ensure that CCTV monitoring at the University is consistent with the highest standards and protections. H. There will be no installation of outdoor CCTV cameras for safety or security purposes without the review and approval of the CCTV Monitoring Panel and the authorization of the Vice President for Public Safety. I. The CCTV Monitoring Panel will review outdoor camera locations to ensure the perimeter of view of outdoor cameras conforms to this policy. The proposed location of such cameras will be provided to the CCTV Monitoring Panel for review and published in Almanac before installation. J. The CCTV Monitoring Panel, with the Vice President for Public Safety, will review all requests received by the Division of Public Safety to release recorded video images obtained through CCTV monitoring. No releases of recorded video images will occur without authorization by the Vice President and the CCTV Monitoring Panel. Excluded from review by the CCTV Monitoring Panel are releases of recorded video images directly related to a criminal investigation, arrest or subpoena or as requested by the Office of General Counsel or Office of Risk Management for investigative or litigation purposes. The CCTV Monitoring Panel may also approve release of recorded video images for other legitimate purposes, such as to protect the University and its members from harm or liability. Five affirmative votes are necessary to approve the release of recorded video images. A record will be kept of each release of recorded video images. K. Students and staff entering certain sensitive locations on campus may have an increased concern for privacy or confidentiality. In order to prevent a possible chilling effect on the use of service at these locations, concerned persons may petition the CCTV Monitoring Panel to forgo the installation of a proposed camera or for the removal of an existing camera. The CCTV Monitoring Panel will determine the appropriateness of an installation weighing the concerns of the person(s) making the requests and the safety and security of the entire community. L. The CCTV Monitoring Panel will review complaints regarding camera locations and determine whether the CCTV Monitoring Policy is being followed. The panel should weigh whether the potential increment in community security outweighs any likely infringement of individual privacy. M. An individual may appeal an adverse decision by the CCTV Monitoring Panel through existing University appeal mechanisms such as the Committee on Open Expression. N. Any member of the CCTV Monitoring Panel may audit the Division of Public Safety’s CCTV monitoring operations, including video storage, at any time without prior notice. O. The CCTV Monitoring Panel will review this policy annually and recommend revisions if needed. A. All operators and supervisors involved in video monitoring will perform their duties in accordance with this policy. B. Division of Public Safety management will assure that responsible and proper camera monitoring practices by its control operators is continuous. D. The Division of Public Safety will maintain and publish semi-annually, ordinarily in May and October, in Almanac and the Division of Public Safety website, a list of outdoor CCTV camera locations it monitors. The Division of Public Safety will also make such list available to anyone requesting it. F. The Division of Public Safety PennComm Center and other central monitoring centers will be configured to prevent camera operators tampering with or duplicating recorded video information. G. All DVR recorders with video images will be stored for a period not to exceed 30 days and will then be automatically written over, unless retained as part of a criminal investigation or in connection with potential litigation or an agency or court proceeding (criminal or civil), or other bona fide use as approved by the Vice President for Public Safety and the CCTV Monitoring Panel. H. All DVRs with recorded video images will be stored in a secure location with access by authorized personnel only. I. Division of Public Safety camera control operators will conduct video observation of areas only in plain view of others. J. Camera control operators will be trained in the technical, legal and ethical parameters of appropriate camera use. 1. Camera control operators will receive a copy of this policy and provide written acknowledgement that they have read and understood its contents. 2. Camera control operators will receive training in cultural awareness. K. Camera control operators will not monitor individuals based on characteristics of race, gender, ethnicity, sexual orientation, disability, or other classifications protected by the University’s Non-Discrimination Policy. Camera control operators will monitor based on suspicious behavior, not individual characteristics. L. Camera control operators will not spot and continuously view people becoming intimate in public areas. M. Camera control operators will not view private rooms or areas through windows. N. Mobile hidden cameras with recording equipment will only be used for criminal investigation by the University Police Detective Unit with the approval of the Vice President for Public Safety. Contiguous includes The Hospital of the University of Pennsylvania, Penn Presbyterian Medical Center and Perelman School of Medicine at the University of Pennsylvania.